While this technology is great, there are challenges that arise when implementing it — especially at scale. Here we will explore these implementation challenges and the effect they can have on your organization. Read ready gauges are currently the most popular way to remotely monitor tanks. The gauge allows a hall effect sensor to be placed in it to monitor tank levels. However, a high percentage of tanks are not fitted with these gauges. Tanks that don’t have the gauge have to be modified in order to allow for remote monitoring, and the installation process can be long. Once they are installed, the gauges provide unreliable readings. Based on a manual gauge, the readings can have a variance of anywhere between 5-15%, leading to uncertainty to the actual tank levels and a higher potential for run-outs. The condition of a tank has a large effect on how easy it will be to install a remote monitoring device. As mentioned previously, if a tank doesn’t already have a read ready gauge, one has to be installed — and most older tanks don’t so the gauges have to be retrofitted. The tank may also have broken gauges that need to be fixed before installation as well. The location of the tank may play a role in if the signal can get through to the end location. For example, if the signal has to go through thick concrete calls, there is a high chance that the readings won’t be delivered. Most devices on the market today have limited battery life. The industry average battery life ranges from 3-5 years, and the high-end devices have a 5-7 year expected battery life. The problem that arises with this is at scale — the more devices that are implemented, the more batteries that will have to be replaced. This will be difficult to do at a large scale, as well as very expensive. Installing the devices requires dedicated time and availability from knowledgeable drivers and/or technicians. At scale, installation requires dedicated resources in order to manage the distribution of devices, installation coordination, customer communication, and general project oversight. Depending on the device and what needs to be done during installation, the individual may be required to have a CTEP certification in order to install and service the device. The installation time is upwards of 15-30 minutes, so the larger the customer base, the more time and resources it will take. If the installation is done on a naturally occurring visit cycle, fleet-wide deployment could take more than one year. 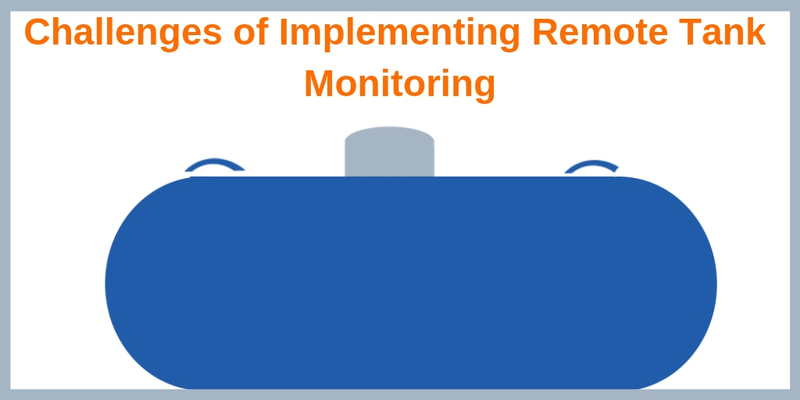 The cost of implementing current tank monitoring devices can be massive, and organizations won’t see a return on investment for a long period of time. The initial cost per unit of devices ranges from $150 to more than $400 across the industry, the cost of the service technician or driver to install them can range from $18 to $27 per hour, and monthly reoccurring expenses can range from $2 to $5 per device. All of this adds up to a substantial cost, especially at scale. For a project of installing more than 100 devices, the industry average deployment time is more than six months. Once installed, it takes more than three years to realize a positive return. Clearly, there are many challenges to overcome to have a successful deployment at scale. The inaccurate read ready gauges are a major hurdle to get to pinpoint tank level monitoring. Be on the lookout for innovative tank monitoring services that implement new methods to more accurately monitor tank levels and provide a complete service to enable a meaningful deployment. Want to see how you can improve your bottom line? Schedule a demo of Smartdrops by Vertrax to see how we can help optimize routes and get a quick ROI.